Help those affected by the Flint water crisis – Donate now! 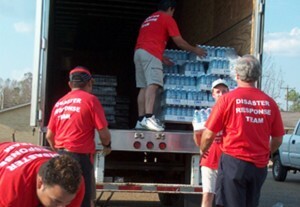 To provide immediate and ongoing assistance to those affected by contaminated municipal drinking water in Flint, Catholic Charities of Southeast Michigan is collaborating with Catholic Charities of Shiawassee and Genesee Counties (CCSGC), which is currently distributing 3,000 cases of water a day. CCSGC is interacting daily with people affected by contaminated drinking water in Flint and will continue to provide assistance after the crisis is alleviated. To ensure CCSGC has maximum flexibility in addressing immediate needs such as bottled water, water filter kits, and replacement filters, Catholic Charities of Southeast Michigan is now accepting financial donations and volunteer referrals on behalf of CCSGC. Catholic Charities of Southeast Michigan will transfer 100 percent of funds received for Flint water crisis relief to CCSGC, which is assisting area residents with short and long-term solutions for children and families. The need will extend beyond ensuring Flint residents receive drinking water free of lead and other contaminants. CCSGC is committed to meet ongoing human needs in Flint. Be sure to designate your gift to “Flint Water Crisis”. Interested in volunteer opportunities to assist with Flint water crisis relief? Call Joyce Hyttinen at 248-537-3304 or email: hyttinenj@ccsem.org.